We asked help to the "mothership" (Lockheed Martin), and they are helping us finding the cause. "Mothership" replied and, it allowed us to find the cause. Try the FSDT Live Update again, to get the updated bglmanx64.dll (4.5.0.3), which should fix the problem. Thanks Umberto, also thanks to Lockheed Martin (assuming they are following this) for agreeing to become involved. Same Prepar3D v4.2 Add-on configuration as before (ALL DISABLED with exception of FSDT Addon Manager). Difficult for me to draw any definitive conclusions from these results other than the fact that the sim does not crash while exiting from the Prepar3D Scenario screen. I'm sorry, but I don't understand what do you mean with Exit "from fully loaded Prepar3D Default Scenario", opposite to just "Exit". In the case of 2 and 3 I'm sitting in the default Raptor, rwy 19 at Eglin AFB (KVPS) after the Prepar3D Default flight has loaded. Mike thank you for doing this. I removed fsdt airports and gsx from my p3d until the crashing is fixed. I’m certainly getting a sense of what Developers must experience with the constant loading and unloading of the sim as they test any changes made! Can be quite tedious and very time consuming, but I do enjoy a challenge! While I’m not involved in any coding changes I’m quite happy to help with testing. I don’t think it is really necessary to remove these products. You can still enjoy what they have to offer so long as you accept the sim is likely to crash on exit knowing that no harm will result from allowing this aberrant behaviour. Hopefully we will have a solution soon and hopefully LM will stay on board until that solution is found. I have unstable flights if I do not remove all the fsdt products. Crashing, freezing, in-flight, not only on exit. 5 completed flights uneventful after removing fsdt. I'm sorry, but I can only repeat and confirm the crash on exit is fixed. This has been confirmed even by LM, which helped us finding the cause. If you have other issues, then they are NOT caused by GSX or any FSDT product. There was another thread which some users reported low fps with GSX installed, which I could replicate, and it really looked like a problem caused by GSX, since it seemed to go away by disabling the Addon Manager addon. However, from the latest posts, it turned out to be an incomplete upgrade from 4.1 to 4.2, for example updating the client without updating the content. Fact that removing our software seems to "fix" the problem, it's only because you don't have other addons that use advanced parts of the SDK which have been updated recently and might not work correctly with just the client or with a failed/incomplete update. Well, speaking as one who has a full and stable installation of Prepar3D 4.2 I find that response to be very disappointing and is threatening to undermine my faith in the product. It is clear to me that something is still happening between Prepar3D and the FSTD Addon Manager during exit, causing Prepar3D to crash, and I feel I have done my best to demonstrate that this is indeed the case. However, it appears that the Developer and LM beg to differ so it looks like we are on a hiding to nothing with very little likelihood of finding a resolution. Unless others feel inclined to chip in with their experiences and/or there is a change of stance on this matter by the Developer, I don’t believe I have anything more to contribute to this now unsatisfactory and unproductive thread. Meantime, I have been maintaining my Prepar3D installation in the requested bare bones state required for troubleshooting purposes. This seems to me to be the least I can offer in view of the time and work spent to date testing for Umberto. However, such patience is finite. Well, speaking as one who has a full and stable installation of Prepar3D 4.2 I find that response to be very disappointing and is threatening to undermine my faith in the product. It is clear to me that something is still happening between Prepar3D and the FSTD Addon Manager during exit causing Prepar3D to crash and I feel I have done my best to demonstrate that this is indeed the case. However, it appears that the Developer and LM beg to differ so it looks like we are on a hiding to nothing with very little likelihood of finding a resolution. Unless others feel inclined to chip in with their experiences I don’t believe I have anything more to contribute to this somewhat unsatisfactory and unproductive thread. I seem to be experiencing this same issue on what was a new/clean install of 4.2 which I purchased on 2018 March 14. Previous to today I never noticed this behavior - I had reinstalled Addon Manager on May 17 to chase some issues I had been having in FSX, so I presume that is where the problem probably originated (I had last used P3D4 on May 14). I had not run Live Update between that initial install of Addon Manager in mid-March (which I had re-downloaded for the fresh install, so it should have been a version current for that date) through May 17. Such behavior makes it seem as though some change between March and May is causing this problem. I can't confirm it is having any other effects other than the crash on termination, but I did come home earlier this evening to find that a paused flight (PMDG 777) had suspiciously crashed without so much as an error dialog (never had that happen before), and it was the attempted diagnosis of that which ultimately turned me onto this issue - which I discovered upon "properly" exiting P3D4. I'm not trying to imply there's any causation or correlation here - seems impossible to tell at this point - just background info. We know precisely what caused the problem in the update that happened around March. And that one IS fixed in the current Live Update, this is really not open to any discussions. Note that, I'm ONLY referring to the silent crash on exit with NO error messages, which can only be visible as an Event in the Event Viewer as an API.DLL crash. This is the only thing this thread is about, and is the only thing the current update was supposed to fix (in addition to other minor fixes in GSX procedures), and it's 100% confirmed to be fixed. So, if you still have THAT specific crash, the only possible reason is that you haven't applied the latest Live Update yet. If you have OTHER crashes or instabilities, which don't manifest as API.DLL silent crashes on the Event Viewer, than please open a new thread, describing the problem, and we'll see if *THAT* one has anything to do with our software. No other crashes or instabilities whatsoever and, yes, I did apply the last update as I believe I stated earlier in this thread. However, in case another update has been released since I’ll try running the FSDT Live Updater again. I appreciate how frustrating this must be for you, Umberto, particularly as your experience is so different. Nevertheless,there are some users, like me, who still have the problem and may feel they are being stone walled by FSDT GSX Support. That too is frustrating! Surely there must be some other way of isolating the cause in our installations? For example does the Addon Manager create any log files? Are there any tools we can employ to monitor what is happening other than the Windows Event Viewer? Believe me, I am just trying to be helpful. Surely there must be some other way of isolating the cause in our installations? For example does the Addon Manager create any log files? 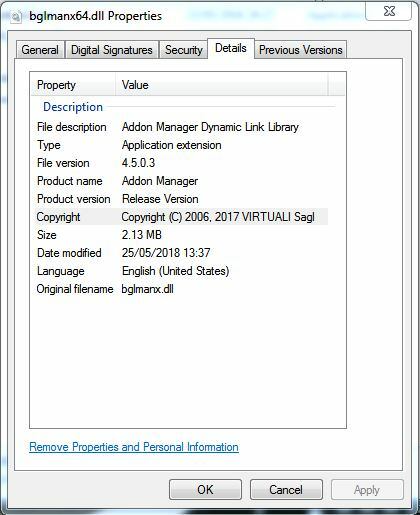 I'm sorry but, as I've said, the one and only possible reason why you have an silent API.DLL crash on exit (only), which disappears if you disable the Addon Manager, is because you still have the previous version installer, so you haven't done the Live Update, or your antivirus blocked it, so you are stuck with the old executable. THIS (and ONLY THIS) crash is fixed now. It's either this, or you are having another crash, one that is not likely caused by the Addon Manager, even if might look similar. In this case, test if the crash happens with all the other addons (except the Addon Manager), are disabled. The api.dll crash did continue to occur after running the Live Update, I don't use antivirus software, and my bglmanx64.dll was updated to 4.5.0.3. But perhaps there's something else going on so I'll do a clean download and reinstall of Addon Manager later today and see if that does the trick. I can only repeat and confirm, I cannot reproduce anymore the API.DLL crash on exit with the current version of the Addon Manager, while I was able to reproduce it (100% of the times), with the previous version. As I've said in my previous message, you should try disabling all other modules, except the Addon Manager, to confirm this is the *same* crash which has been discussed here, which is now fixed.